"Seven," a dark, grisly, horrifying and intelligent thriller, may be too disturbing for many people, I imagine, although if you can bear to watch, it you will see filmmaking of a high order. It tells the story of two detectives - one ready to retire, the other at the start of his career - and their attempts to capture a perverted serial killer who is using the Seven Deadly Sins as his scenario. As the movie opens, we meet Somerset (Morgan Freeman), a meticulous veteran cop who lives a lonely bachelor's life in what looks like a furnished room. Then he meets Mills (Brad Pitt), an impulsive young cop who actually asked to be transferred into Somerset's district. The two men investigate a particularly gruesome murder, in which a fat man was tied hand and feet and forced to eat himself to death. His crime was the crime of Gluttony. Soon Somerset and Mills are investigating equally inventive murders involving Greed, Sloth, Lust and the other deadly sins. In each case, the murder method is appropriate, and disgusting (one victim is forced to cut off a pound of his own flesh; another is tied to a bed for a year; a third, too proud of her beauty, is disfigured and then offered the choice of a call for help or sleeping pills). Somerset concludes that the killer, "John Doe," is using his crimes to preach a sermon. The look of "Seven" is crucial to its effect. This is a very dark film, the gloom often penetrated only by the flashlights of the detectives. Even when all the lights are turned on in the apartments of the victims, they cast only wan, hopeless pools of light. Although the time of the story is the present, the set design suggests the 1940s; Gary Wissner, the art director, goes for dark blacks and browns, deep shadows, lights of deep yellow, and a lot of dark wood furniture. It rains almost all the time. In this jungle of gloom, Somerset and Mills tread with growing alarm. Somerset intuits that the killer is using books as the inspiration for his crimes, and studies Dante, Milton and Chaucer for hints. Mills settles for the Cliff Notes versions. A break in the case comes with Somerset's sudden hunch that the killer might have a library card. But the corpses pile up, in cold fleshy detail, as disturbingly graphic as I've seen in a commercial film. The only glimmers of life and hope come from Tracy (Gwyneth Paltrow), Mills' wife. A movie like this is all style. The material by itself could have been handled in many ways, but the director, David Fincher ("Alien 3"), goes for evocative atmosphere, and the writer, Andrew Kevin Walker, writes dialogue that for Morgan Freeman, in particular, is wise, informed and poetic. ("Anyone who spends a significant amount of time with me," he says, "finds me disagreeable.") Eventually, it becomes clear that the killer's sermon is being preached directly to the two policemen, and that in order to understand it, they may have to risk their lives and souls. 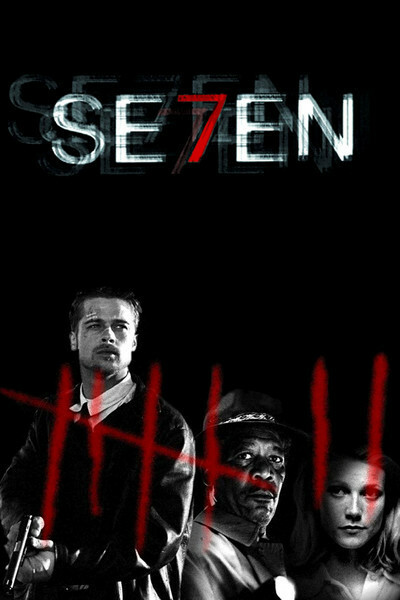 "Seven" is unique in one detail of its construction; it brings the killer onscreen with half an hour to go, and gives him a speaking role. Instead of being simply the quarry in a chase, he is revealed as a twisted but articulate antagonist, who has devised a horrible plan for concluding his sermon. (The actor playing the killer is not identified by name in the ads or opening credits, and so I will leave his identity as another of his surprises.) "Seven" is well-made in its details, and uncompromising in the way it presents the disturbing details of the crimes. It is certainly not for the young or the sensitive. Good as it is, it misses greatness by not quite finding the right way to end. All of the pieces are in place, all of the characters are in position, and then - I think the way the story ends is too easy. Satisfying, perhaps. But not worthy of what has gone before.